Christmas has come and gone. The New Year is three days' old. And here I am, writing about a recipe that is a very untraditional Christmas tradition in the C household. I have been baking this cake at Christmas every year since I learnt how to bake not so long ago. It is a marvellous change from the usual Christmas fare in that it uses bananas. Yet, it imbibes the spirit of the festive season with the use of fruit and spice. Start by adding the spices to the flour. Rub in the softened marg till the mixture is the consistency of breadcrumbs. Add the sugar, orange zest and crushed walnuts. Now for the wet ingredients. Gently fold in the eggs, the mashed bananas and the honey. Make sure the bananas do have some lumpy bits in them, rather than being completely gooey. It just helps with the texture of the cake. Pour the mixture into an 8-inch prepared and lined cake tin. Bake the cake in the centre of a pre-heated oven at 180 degress for about an hour to 80 minutes. Or till a knife in the centre comes out clean. Allow the cake to cool on a rack for a few minutes before digging in. Just to add to the festive flavour, serve with a dollop of brandy butter or any other alcohol-infused cream. Christmas is not a prerequisite to baking this cake. It tastes just as scrumptious any time of year, with or without brandy butter. Popping by from Recipe of the week! This sounds amazing and we always have bananas in the fruit bowl, especially very ripe ones as the kids get fussy once they start to blacken. 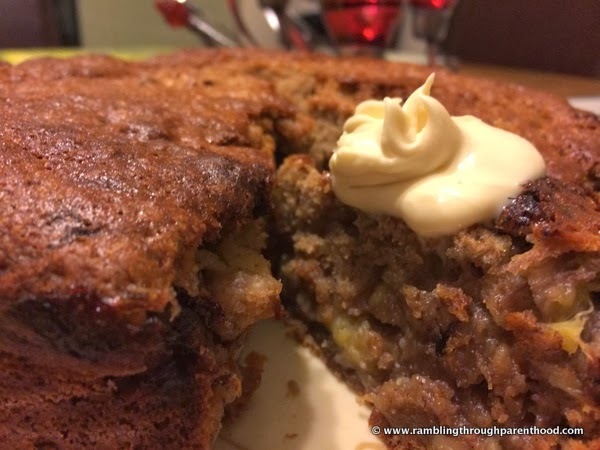 I haven't tried using spice in a banana cake before but it sounds yum. Thanks for joining in with #recipeoftheweek - I've pinned and tweeted this recipe :) There's a fresh linky live at the moment, so do please pop over if you haven't already!